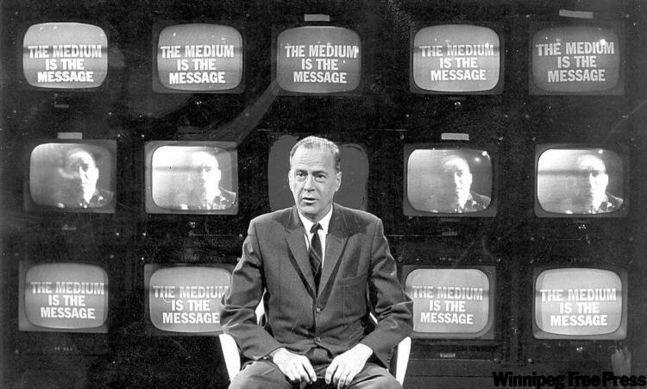 McLuhan is an important thinker for focusing attention on the effects of mediums on human experience. The crude edit of McLuhan’s Wake that we watched highlights his concept of the media “tetrad,” a conceptual tool for thinking about the “laws of media” that he develops in his later work. The text we will be focusing on, Medium is the Massage, was published in 1968 after he felt that his major work, Understanding Media (1964) was misunderstood by the public. The text tries express his thoughts about media while exploring the medium of the book and the genre of academic discourse. One thing to note is that his way of forming ideas and developing them is indirect: he imposes upon the reader more interpretive work than usual. This is not for the purpose of confusing, but rather for requiring the reader to engage the ideas creatively and to synthesize them for themselves. McLuhan describes his style as “probation” and his expressions as “probes” – they are meant to activate creative interpretation and to suggest connections rather then define and spell out a technical concept. If you are interested in his work, a great and engaging resources is an online archive of all his television appearances: marshallmcluhanspeaks.com.